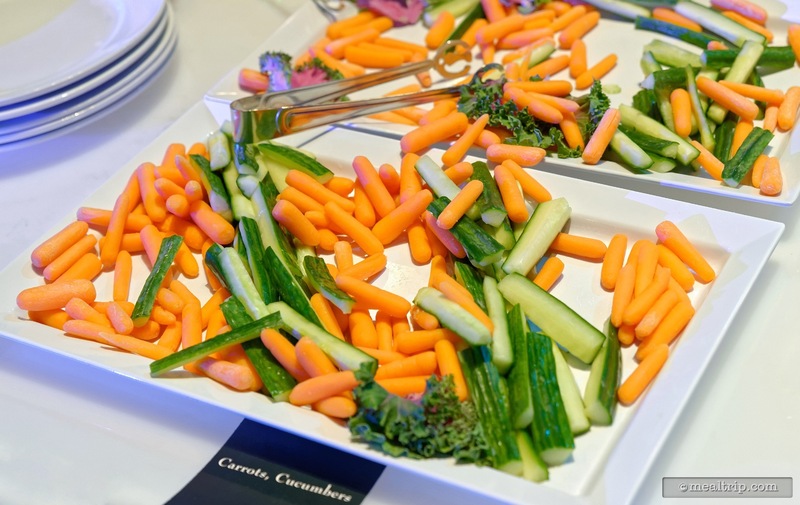 Special Event, Buffet | Click on any image to view larger. 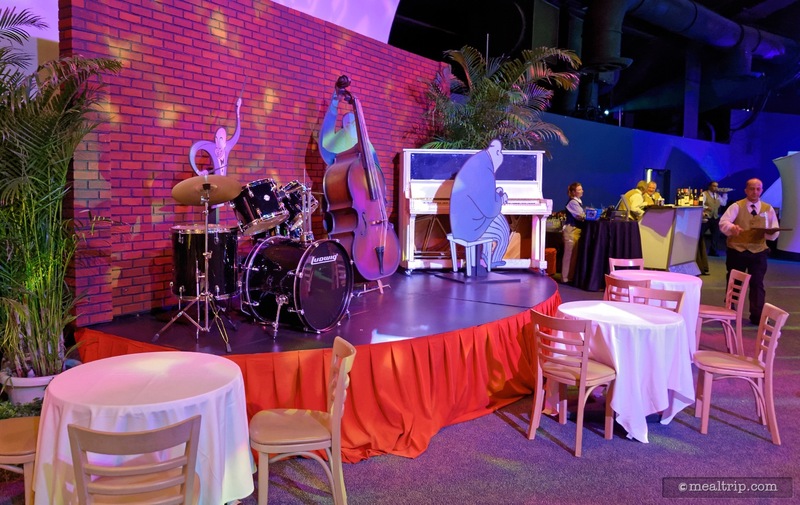 The New Year's Eve at Epcot World ShowPlace listing is a Special Event, Buffet dining location at Epcot featuring American, Wine, Beer, Spirits or Beverage-based cuisine. There are 50 photos in the Mealtrip photo gallery for this location and dining period. 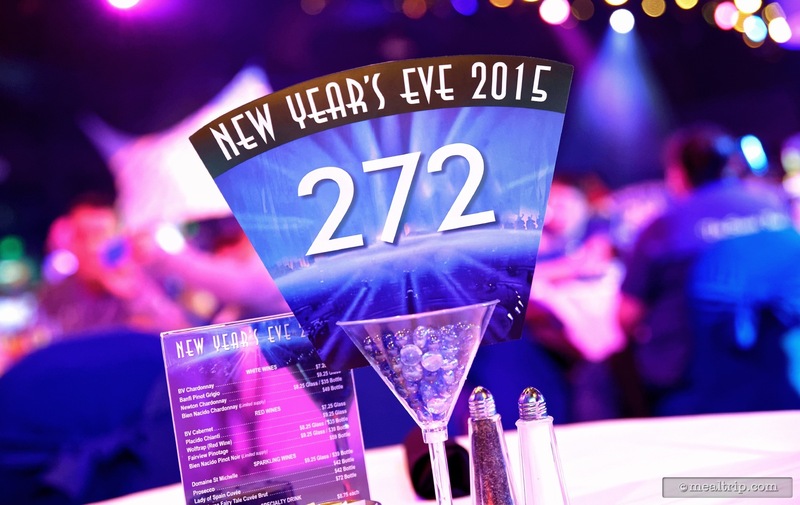 The New Year's Eve at Epcot World ShowPlace listing currently has a score of 68 out of 100. 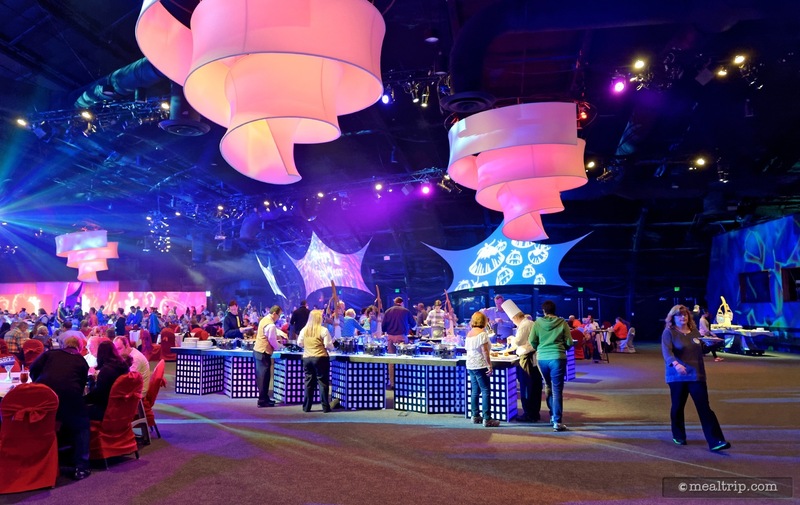 Click here to read all of the reviews for this location, or log in to Mealtrip.com to add your own review for New Year's Eve at Epcot World ShowPlace. 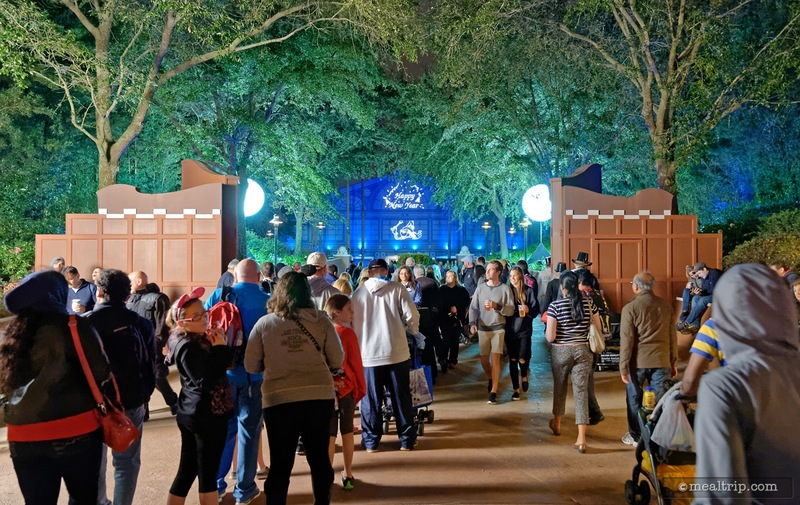 Just past the Canada Pavilion (next to the Joffrey's coffee stand) you'll find two giant doors that lead to the World ShowPlace building. This is where the New Year's Eve Dining Event takes place. There's a New Year's Eve logo on the outside of the World ShowPlace building. Each table is numbered and a host will help you locate your table after you check-in. There are many, many tables (as you can see, there are at least 272 tables). 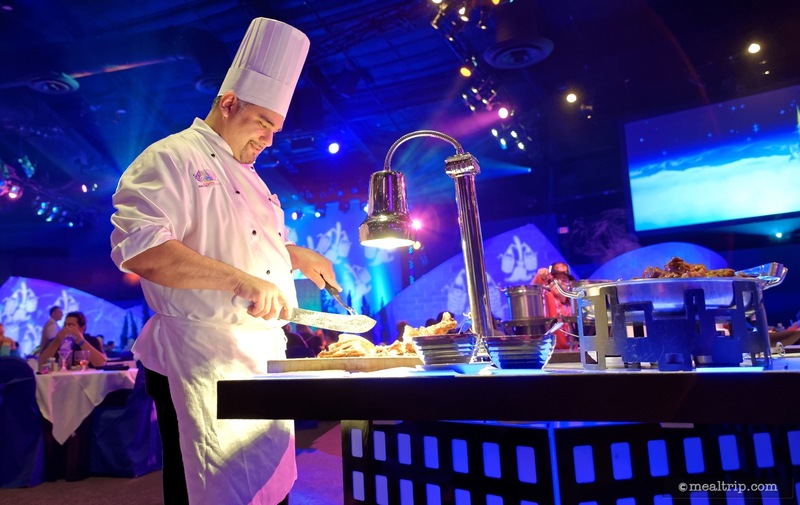 There are a few chefs around at carving stations, but it's imporant to point out, this is not really a "Party for the Senses" (where chefs are all over the place). 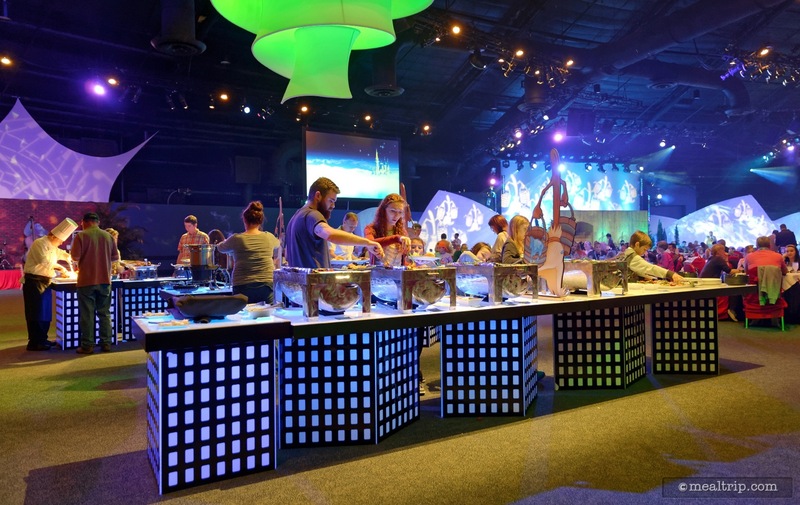 There are many long buffet tables set up in the center of the dining area. 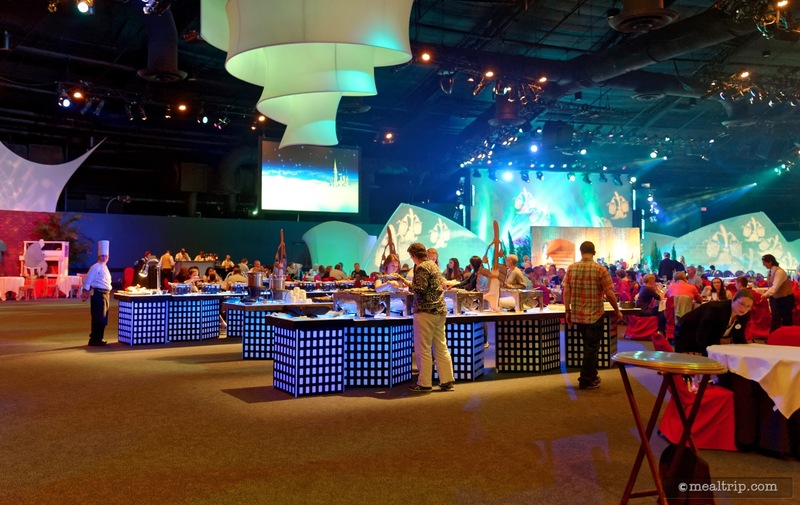 Even though there are hundreds of guests dining at once, there never seemed to be more than a few people at the tables at any given time. 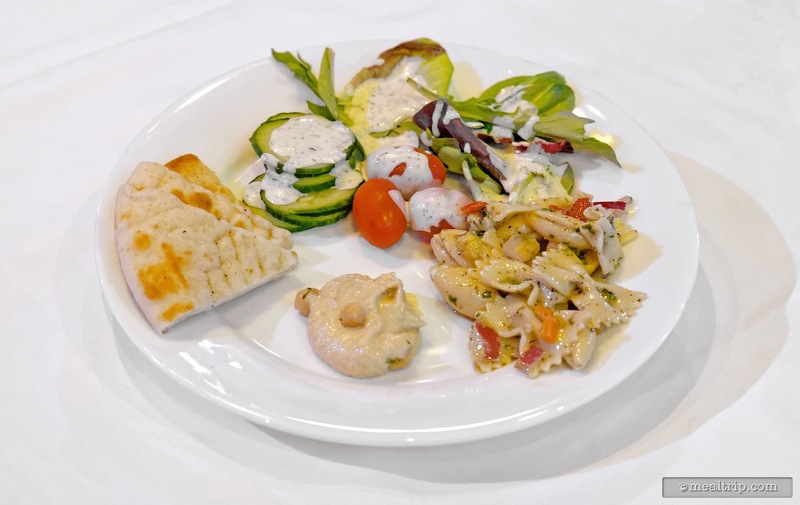 From the "starters" buffet line, a garden salad, seafood pasta salad, and hummus with pita bread. There are usually two kinds of hot soup available. 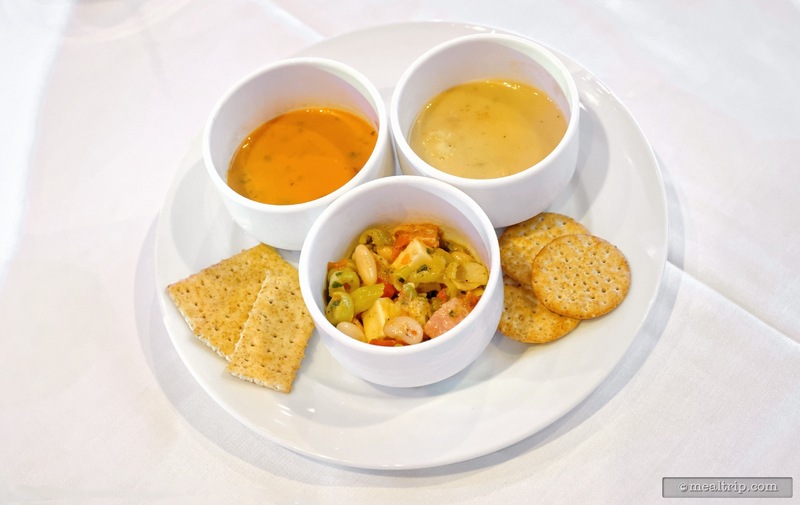 A tomato bisque and corn chowder are pictured here along with a bowl Mediterranean pasta salad. 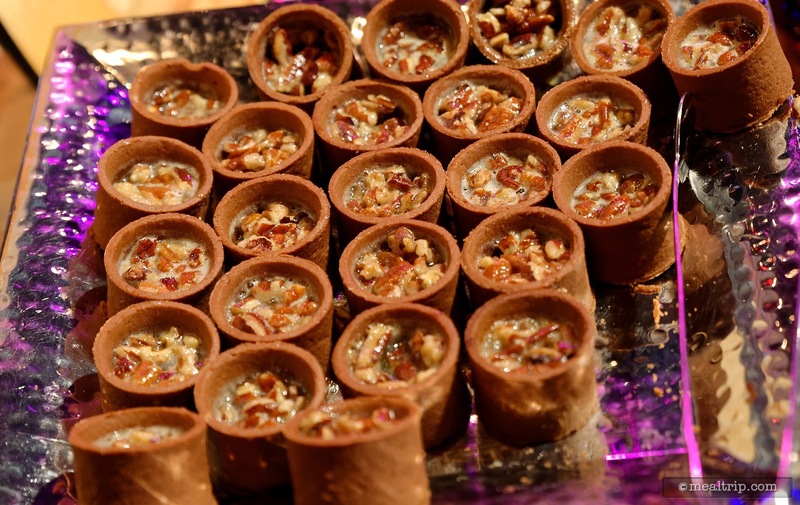 There are desserts a plenty at the New Year's Eve Dining Event. Pictured here are a peanut butter and chocolate cupcake along with a carrot cake cupcake. In the front (looking rather ominous) is a raspberry puff pastry. 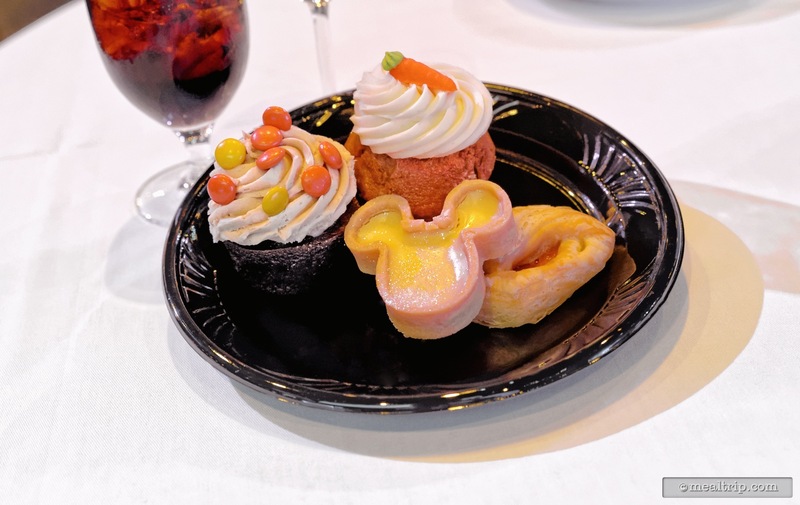 The Mickey shaped dessert in front is a lemon tart. The tart has been dusted with glittering sugar crystals. 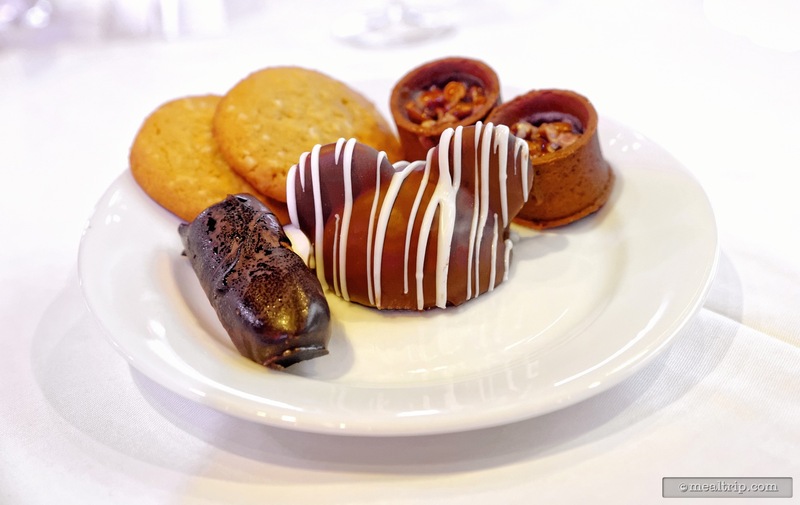 Other desserts at the Epcot New Year's Eve Dining Event include no-sugar added lemon cookies, pecan chocolate tarts, chocolate mini-éclairs, and a chocolate Mickey dome with white chocolate stripes. Even though the dining floor may look crowded, the tables are spaced well apart and there's enough room to move around. Remembering where your table is... that's a different story. 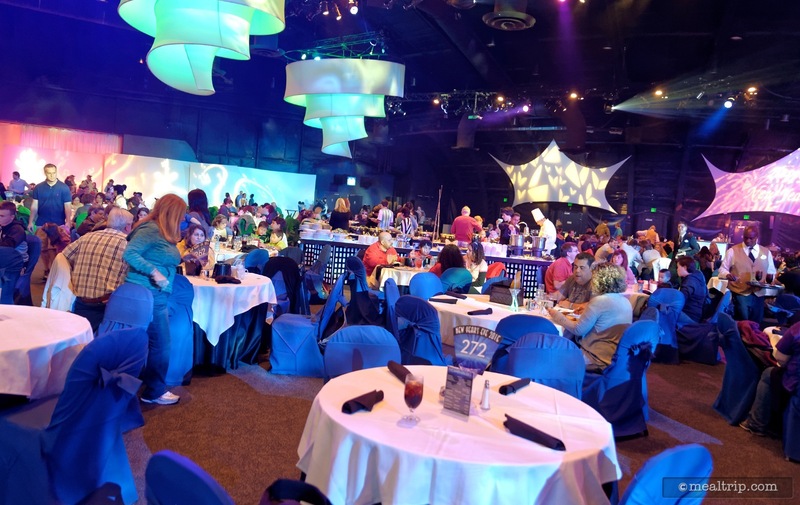 The dining space inside the World ShowPlace building is large. The buffet tables are (more or less) set up in the center of the building. 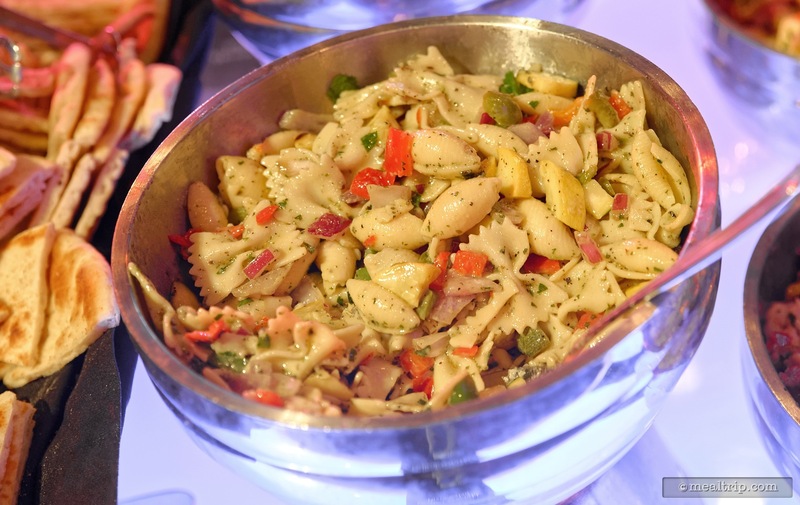 One of the "hot item" buffet lines at Epcot's New Year's Eve Dining period at World ShowPlace. Disney has set up what they call photo vignettes around the room. These are mixed-media displays from various Disney movies and park scenes. 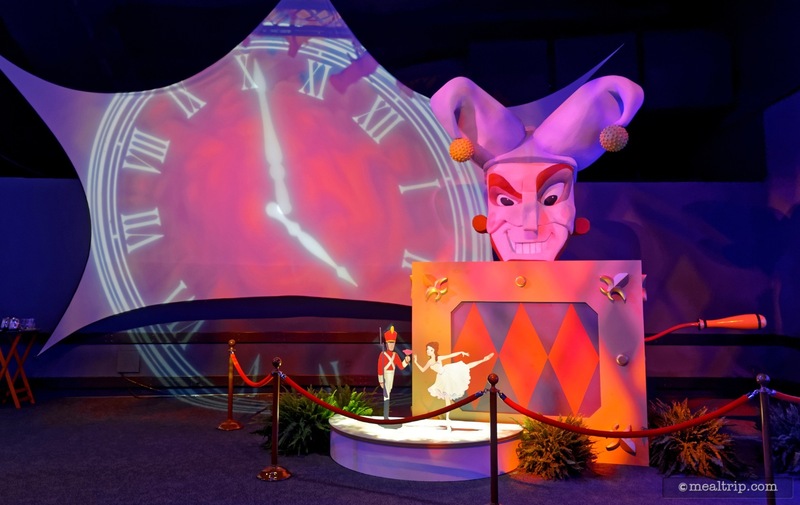 The theme for this particular year's event was Fantasia, so all of the vignettes were based on themes from either the original or newer Fantasia movies. I'm not as familiar with the Fantasia franchise as I should be. 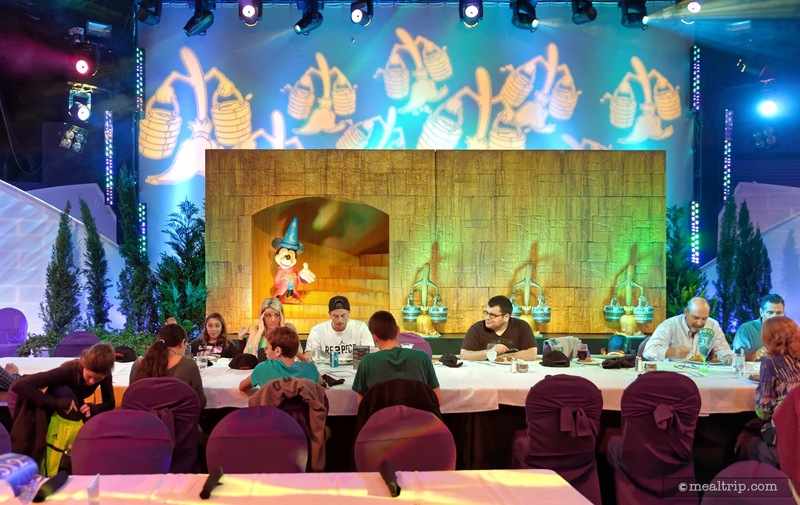 This vignette is either a scene from the Sorcerer Mickey segment, or possibly a new adaptation of the last supper. 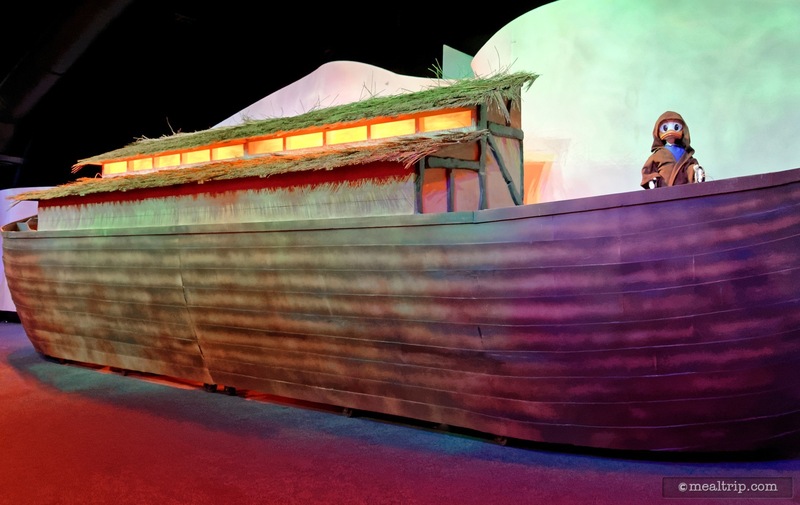 In this vignette, Jedi Donald is standing at the bow of Noah's Ark. Hey, I don't make this stuff up. Use the force Donald, use the force. 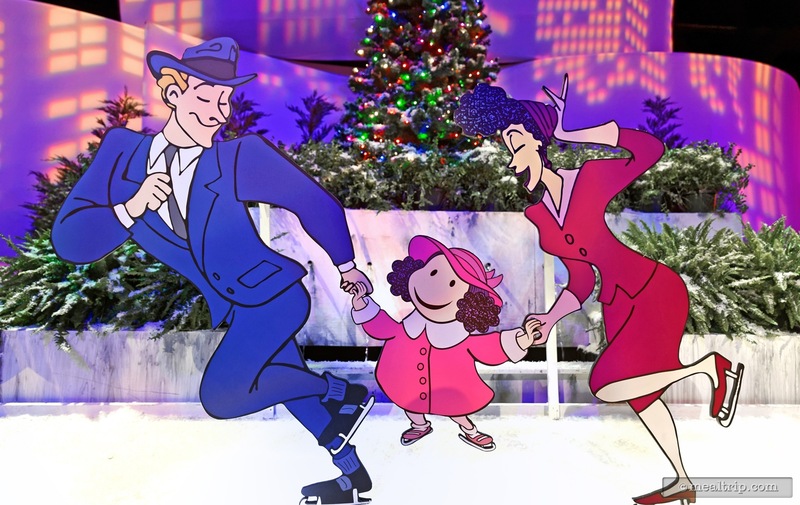 A holiday in the city vignette at Epcot's New Years Eve dining event in World ShowPlace. Stylized ice skating people from... Fantasia... Man, I really need to watch these movies again. The vignettes are quite complete and you're more than welcome to get into the photo. In years past, there have not been any PhotoPass photographers, so you're on your own as far as taking pictures goes. 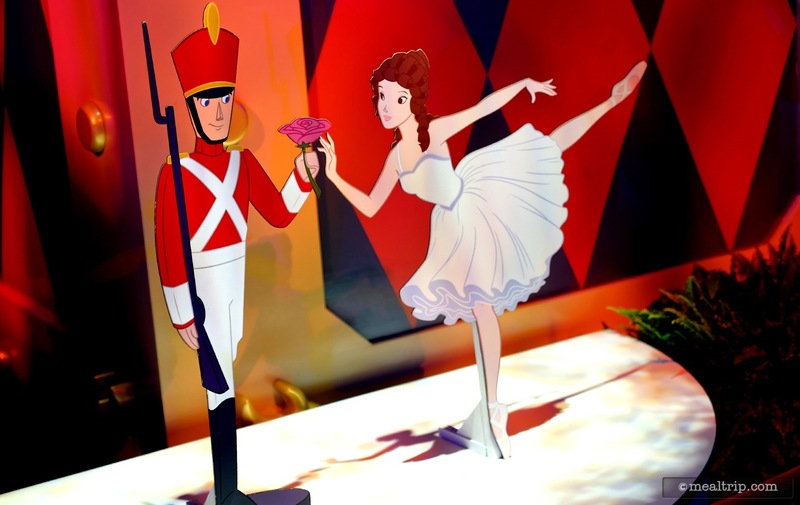 A close up of the Toy Soldier and Ballerina from the Jack in the Box segment of Fantasia 2000. 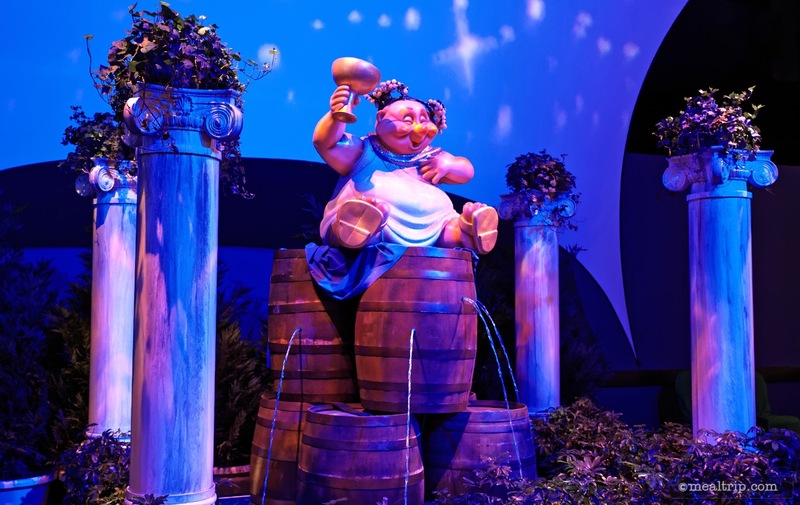 How often do you get to see a life-sized version of Bacchus from Fantasia? This vignette even has a water feature. That barrel of wine he's sitting on has sprung a leak (or two). 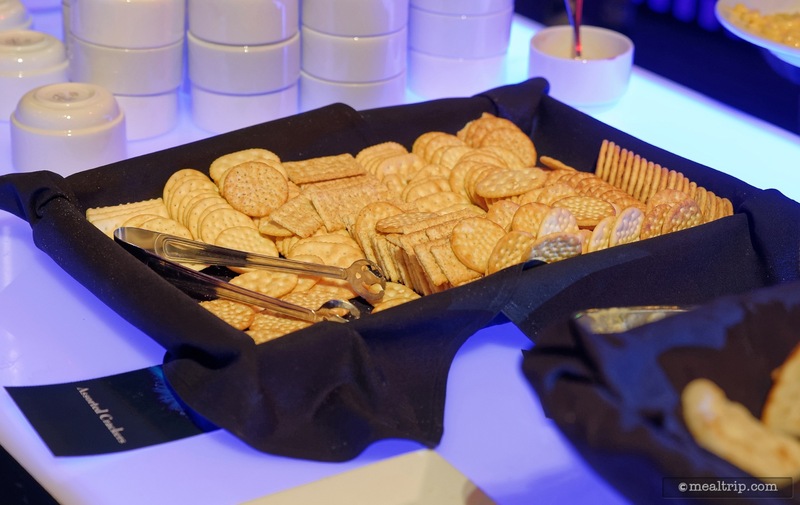 At least two soups and various crackers are available. On this night the soups were tomato bisque and corn chowder. 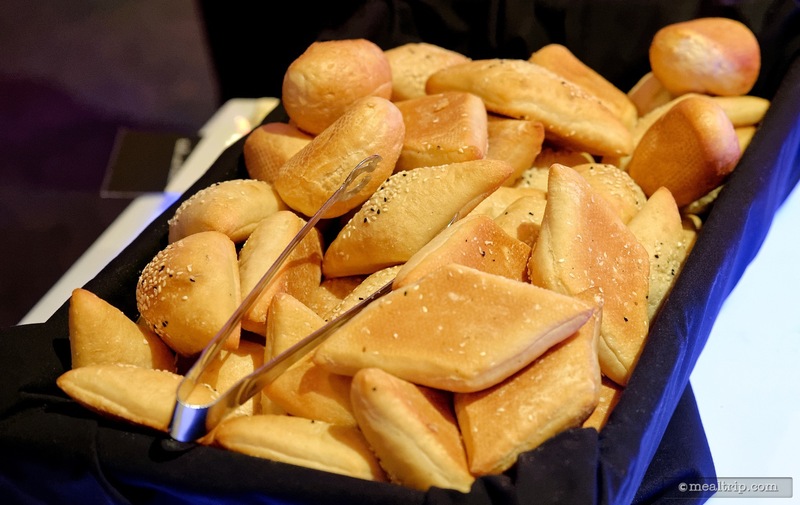 Various bread options with butter and hummus are available. 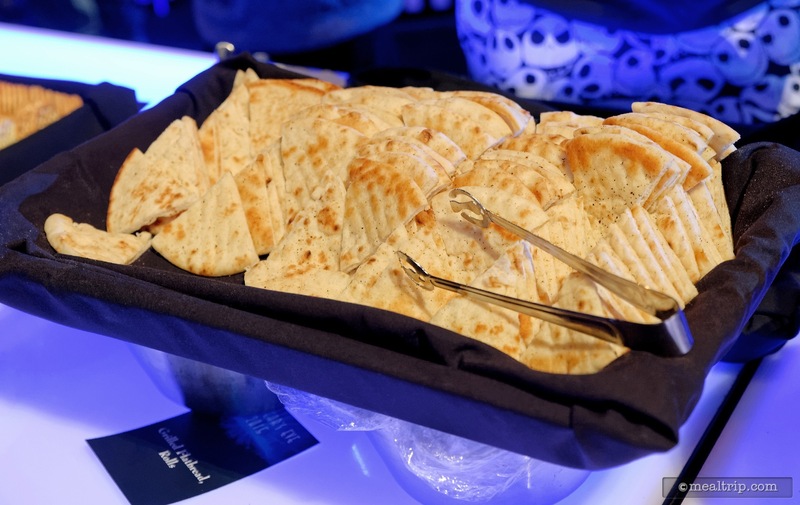 Pita bread and two types of hummus rounded out the "bread and soup" area. Next up, various stick vegetables for dipping and a couple of dressings. 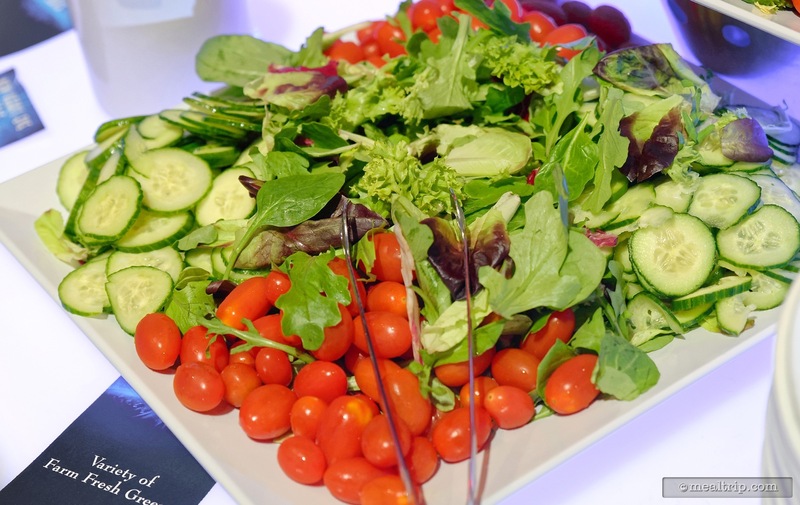 A variety of farm fresh greens are available for making your own garden salad. Mmmmmm... the Seafood Mediterranean Pasta was quite good! 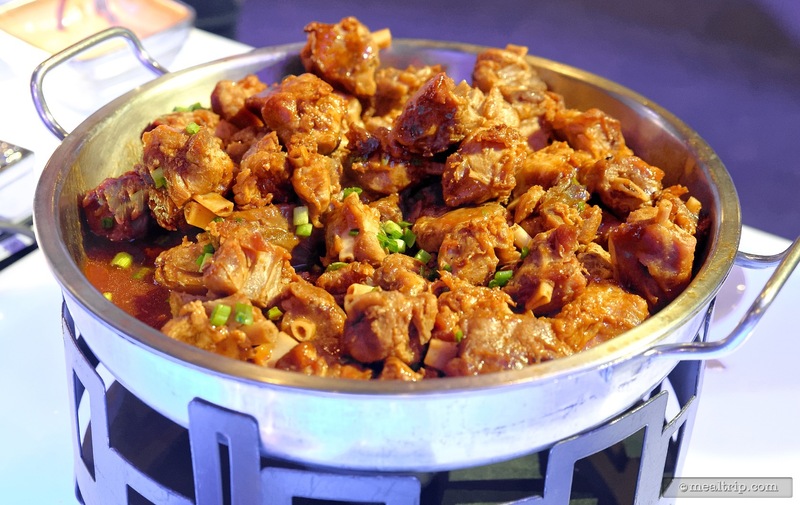 Sticky Pork Shanks at the Epcot New Year's Eve Dining event. 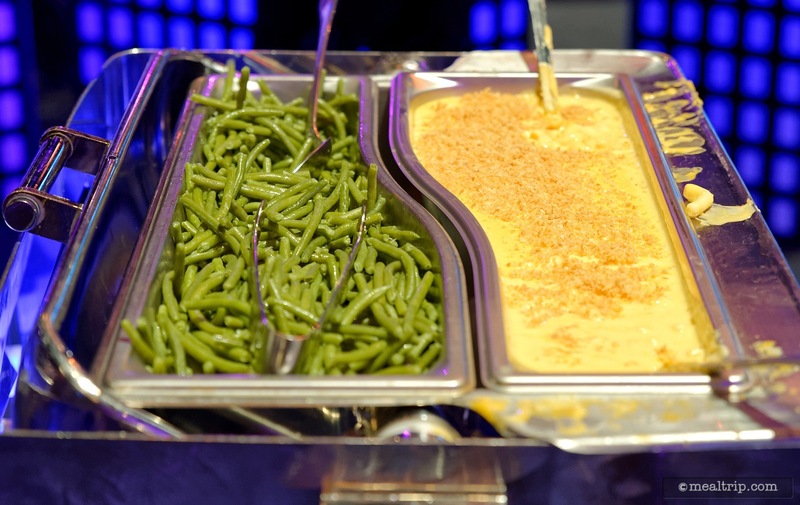 On the "warm items" buffet line, you'll find many "side dishes" with a carving station at the end of the line. 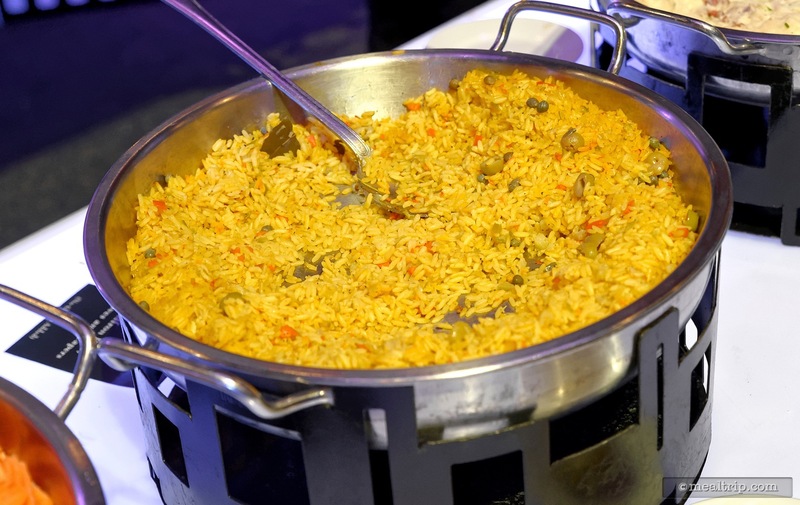 Pictured here, yellow rice with a few veggies tossed in the mix. 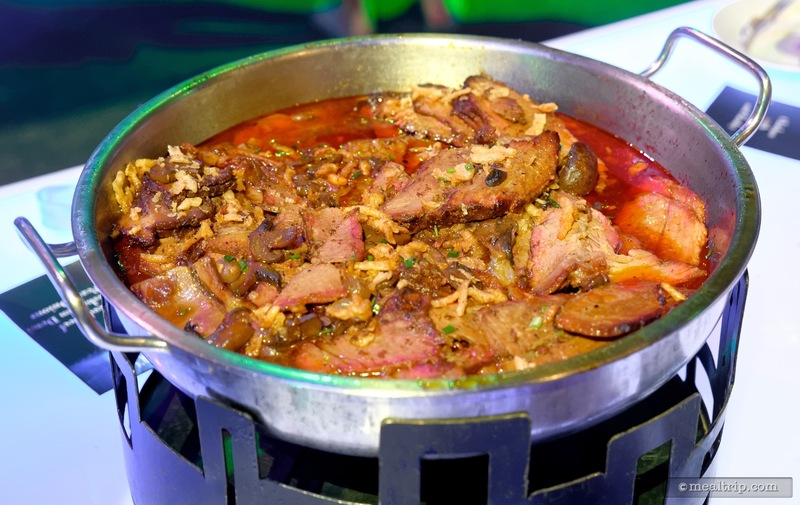 And then there's my typical issues with buffet style food, clearly someone has used the dirty rice spoon in the sliced beef tray creating a new dish called Dirty Sliced Beef and Rice. Ooooo... a double-sided "side dish" keep-warm tray. Shown here, some fresh green beans and a very saucy mac and cheese topped with panko breadcrumbs. 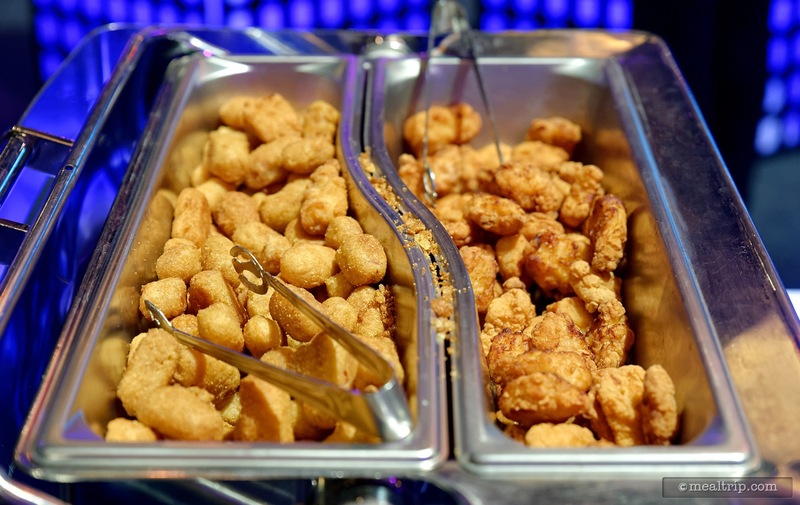 From the (slightly lower) children's table, Tater Tots and Chicken Nuggets. 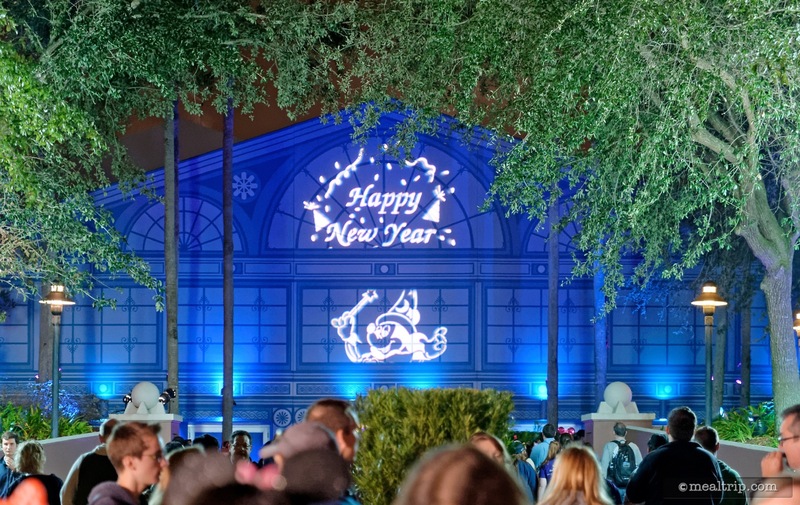 Everyone will find something they'll like to eat at Epcot's New Years Eve dining event. 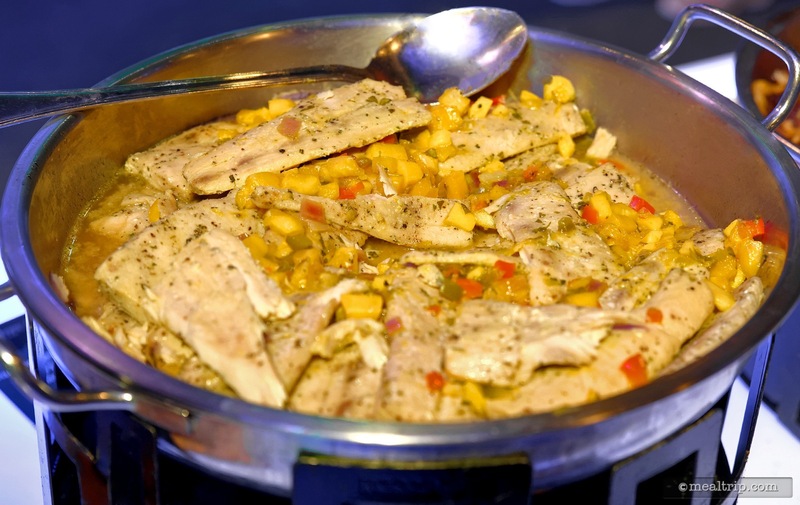 The Mahi, Mango, and Peppers was one of the warm items available at the New Year's Eve dining event at Epcot's World ShowPlace. As with most buffet white-fish, it's best to get one of these, right as the tray is refreshed. 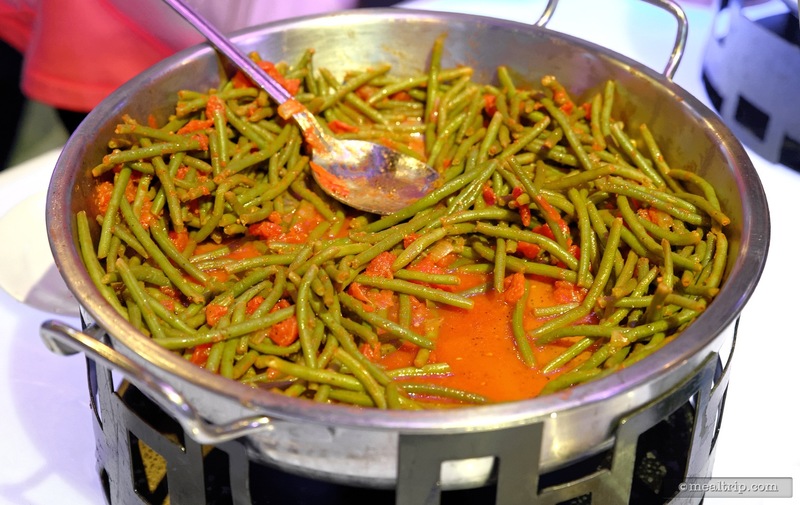 Green beans in a garlic tomato sauce at the New Year's Eve dining event at World ShowPlace. 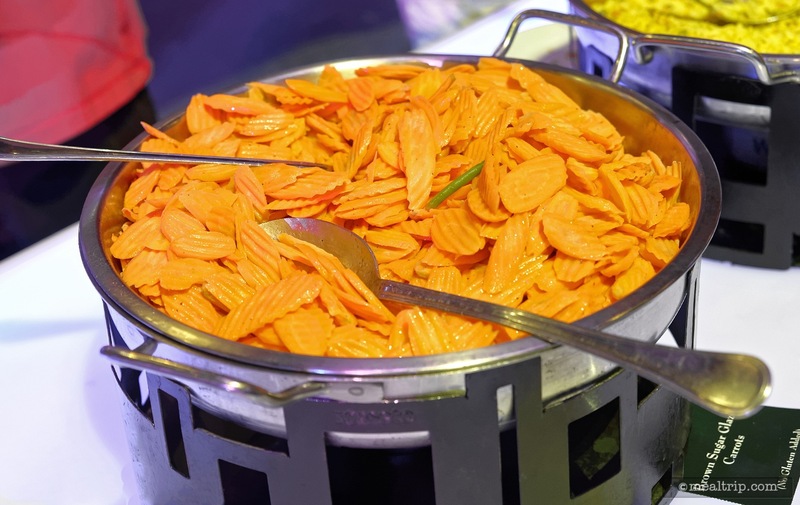 Buttered Carrots on the warm-items buffet table. 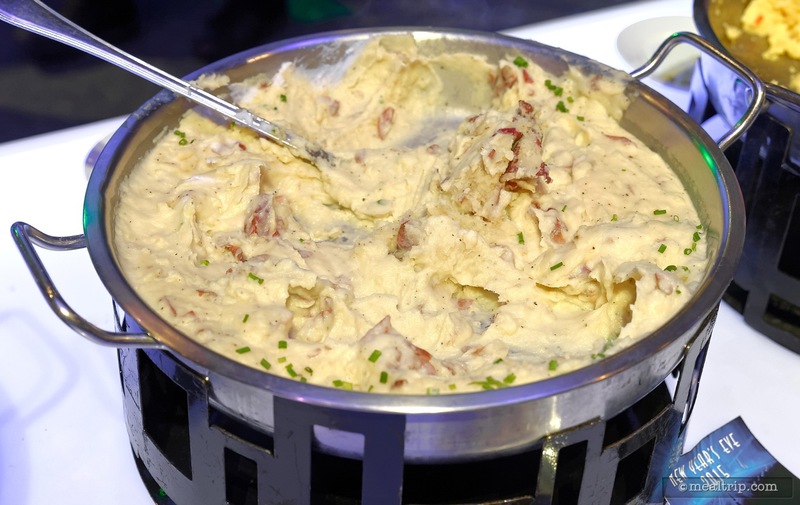 Disney really does mashed potatoes well... butter, garlic, smooth and yet chunky, I'm always glad to see the keep-warm tray of mashed potatoes! 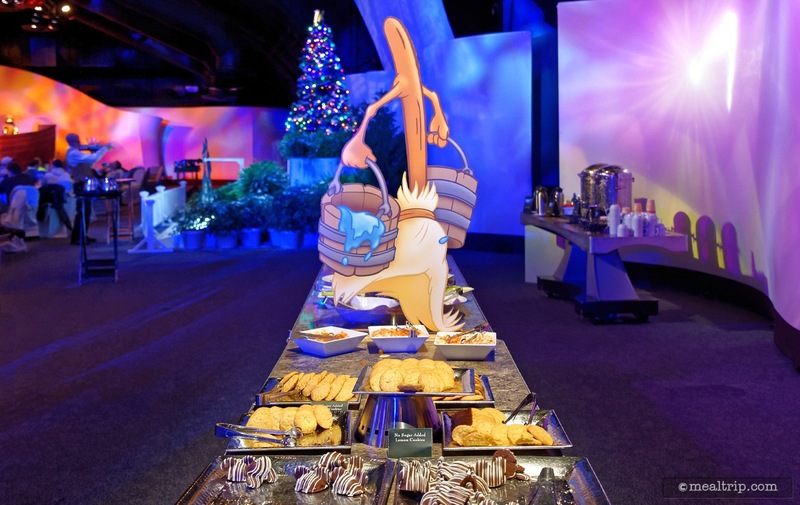 One of the broomsticks from Disney's Fantasia guards the dessert buffet table. 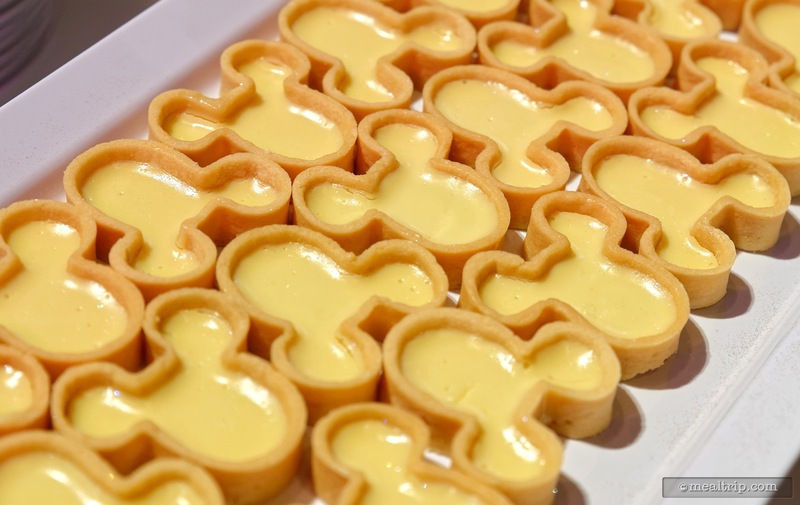 Interlocking Lemon Tarts in the shape of Mickey's head! 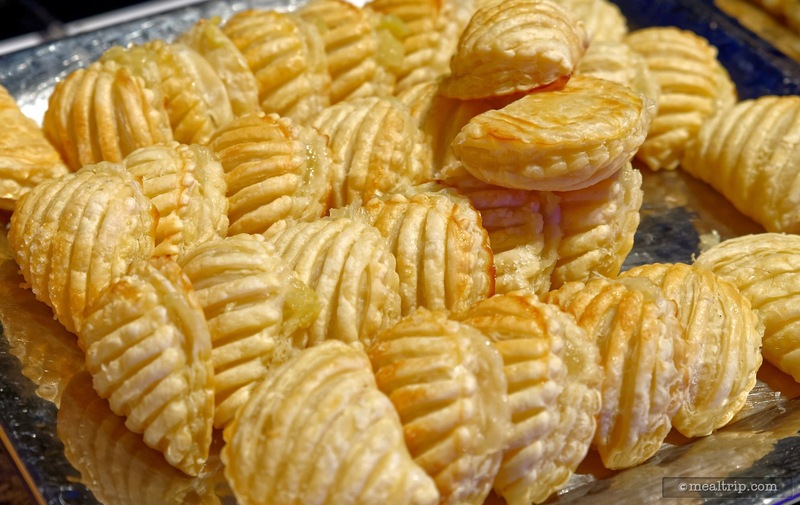 These non-mini tarts were dusted with a sparkling semi-coarse sugar as well. 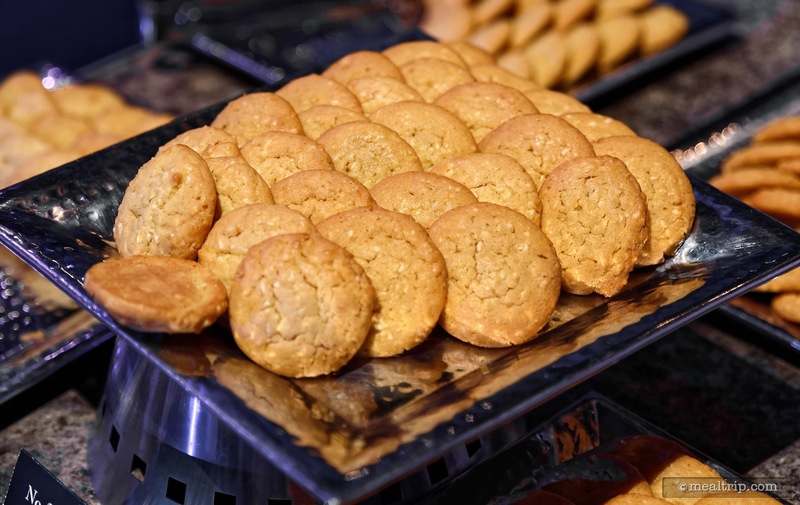 No-sugar added Lemon Cookies are usually on-hand at most any of Disney's buffet-style offerings. 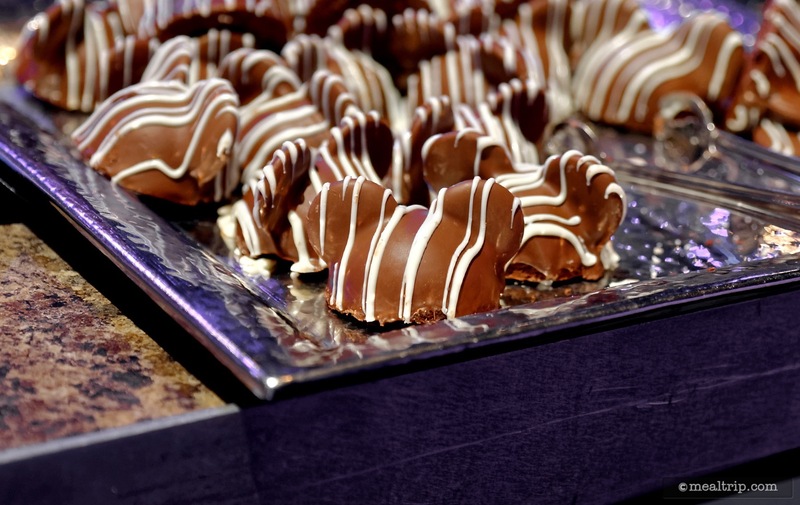 These Chocolate Mickey Domes have a brownie center with chocolate ears and then are lined with white chocolate drizzle. Best, when eaten whole... or cut exactly in half (the ears make great handles for picking up the dessert). 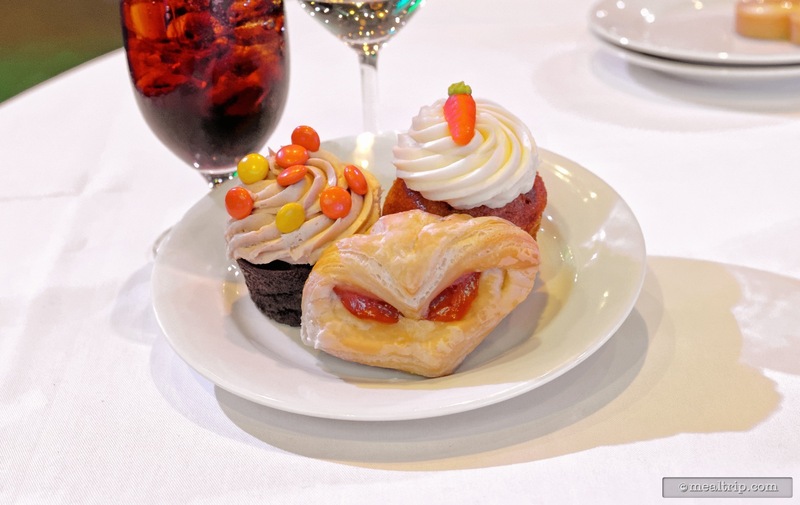 Various fruit filled pastries are available for a lighter take on dessert. 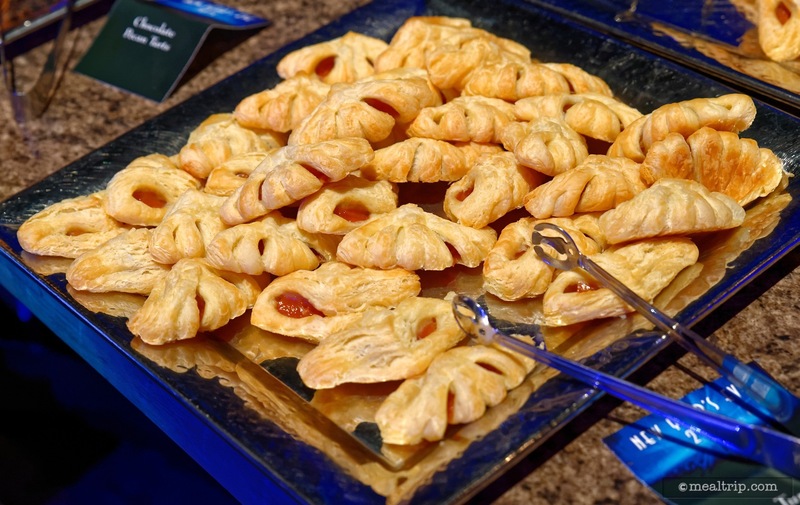 Here, a tray of apple filled puffs are ready to go. Another form of fruit jam filled tart seems to focus more on the filling and less on the flaky puff pastry. It's nice to have options... too bad everything is filled with just apple preserves. Cherry or raspberry would be nice. 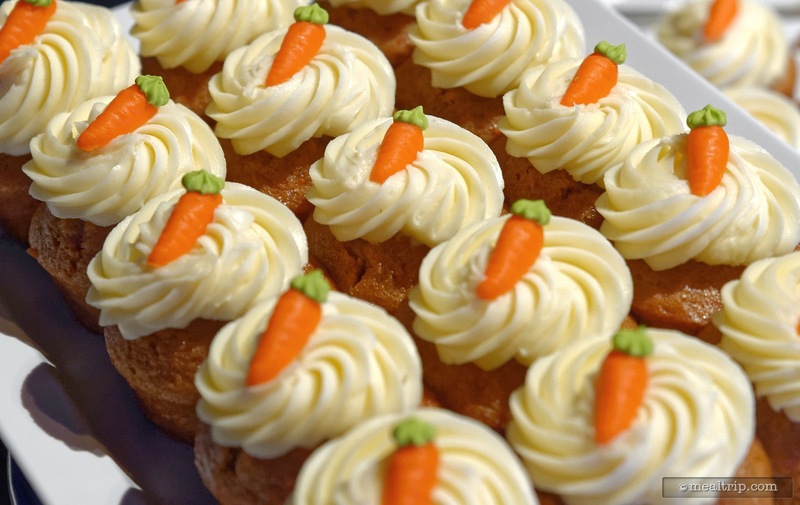 The cupcakes at Epcot's New Year's Eve buffet dining event are usually quite good. 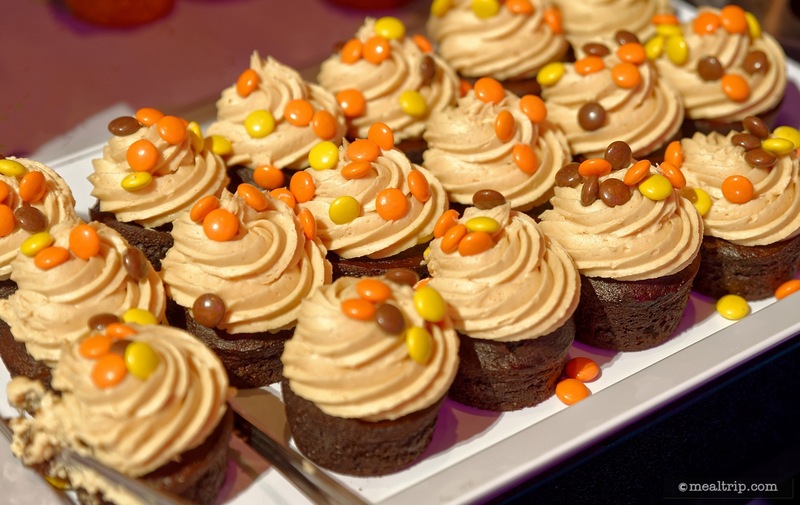 Here's a photo of my favorite... a chocolate and peanut butter cupcake topped with peanut butter pieces (as I'm careful not to use a "brand name" candy in my description). 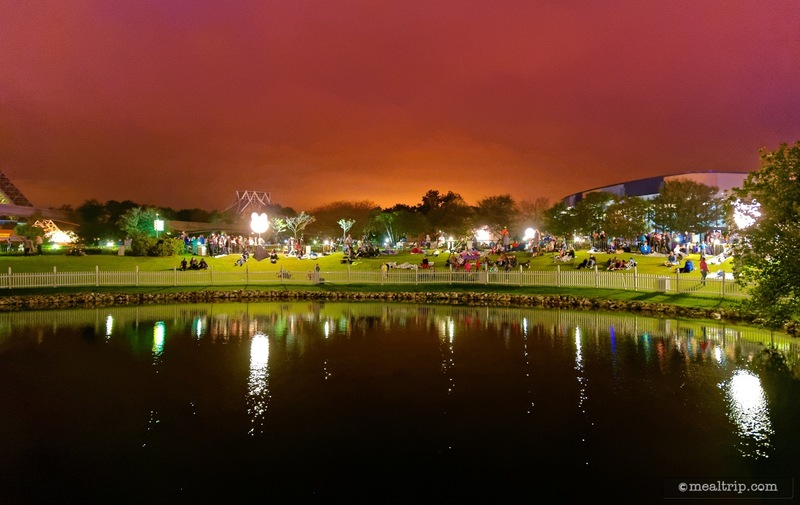 There are so many guests at Epcot for New Year's eve, that special "grass side" seating is opened up on the west side lagoon for some unique fireworks viewing opportunities. 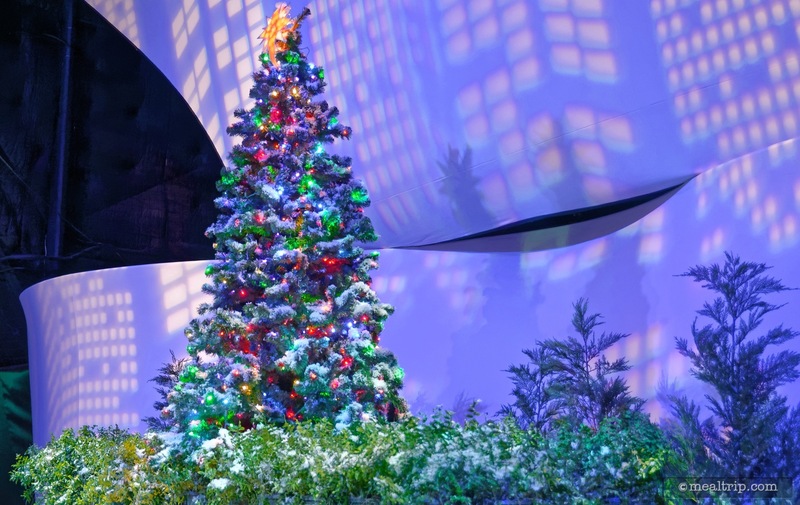 After the New Year's Eve Dining event as Epcot, it's fun to walk around Epcot. Here we are looking back at the American Pavilion from the walkway to Future World. 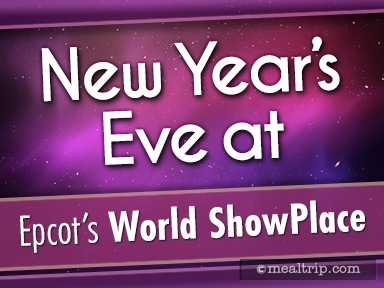 Make sure you have plenty of time to get to World ShowPlace for the New Year's Eve Dining event. The park is almost always at capacity as the sun goes down. 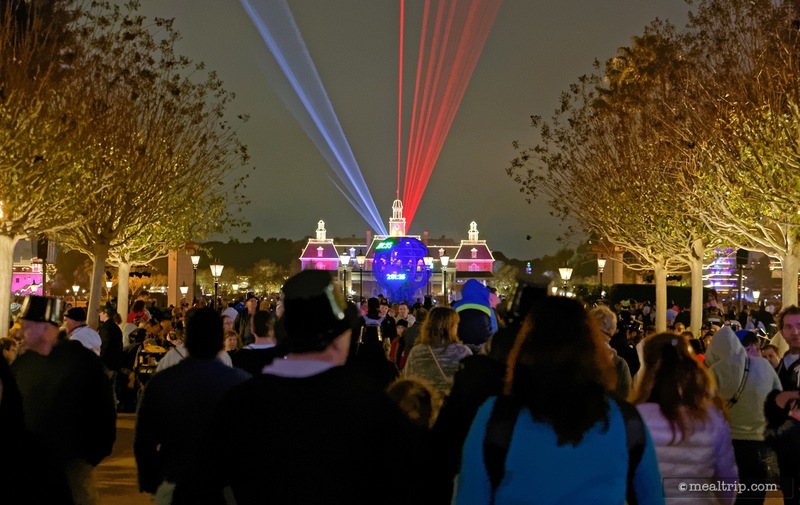 If you are going to the Epcot New Year's Eve dinner from the front gate of Epcot, you'll have to make your way through large crowds. 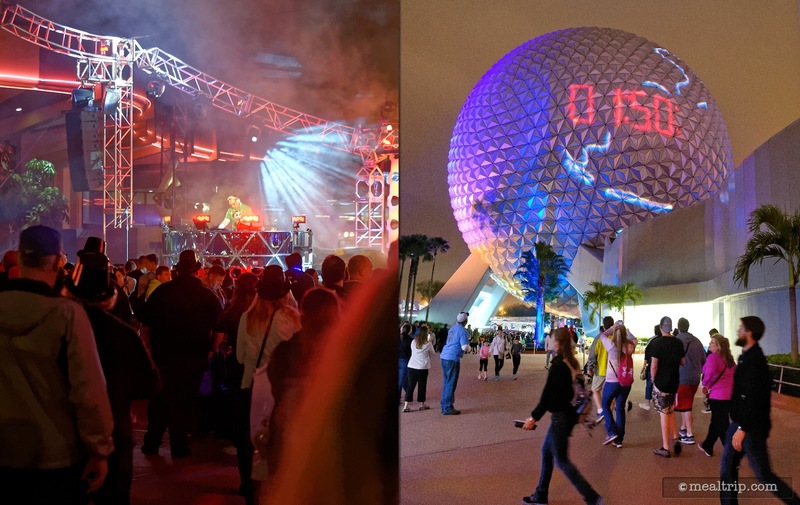 A DJ is set up just behind the fountain at Spaceship Earth and a countdown clock is projected on the large geodesic attraction. One last note... Leave plenty of time for parking. 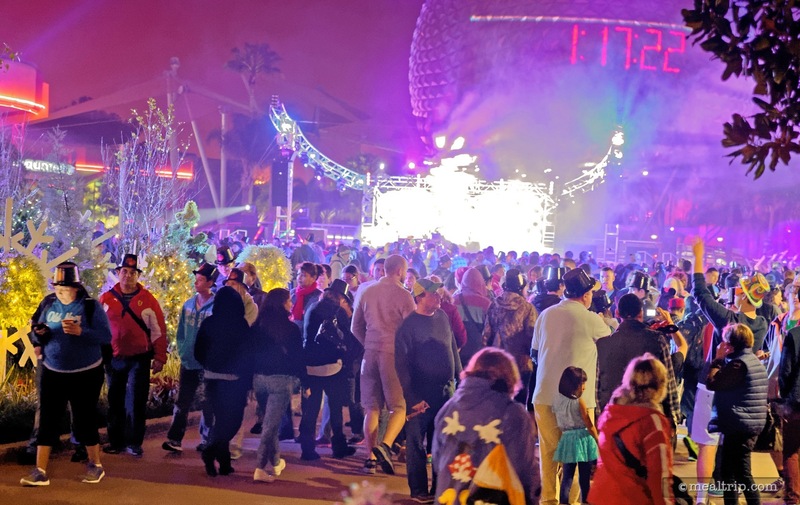 New Year's Eve is one of the busiest days for Epcot. 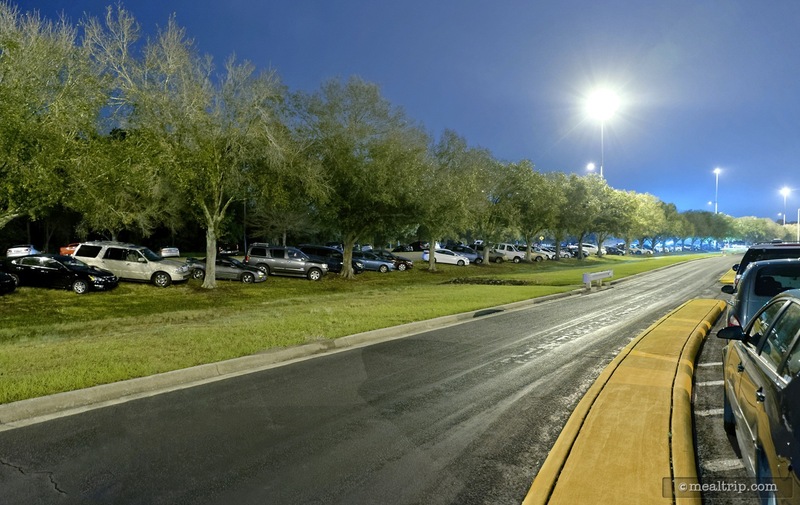 This photo shows a row of cars, parked in the grass, at the very back of all the other concrete parking. Did you guys park in "journey" or "imagination"... no, we're parked in "the woods".